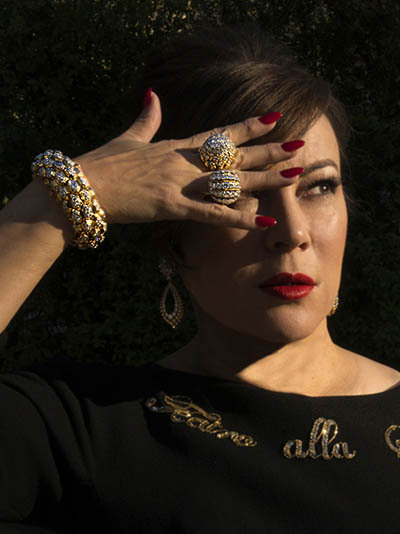 Jennifer Tilly is cut from the classic cloth of Hollywood glamour. 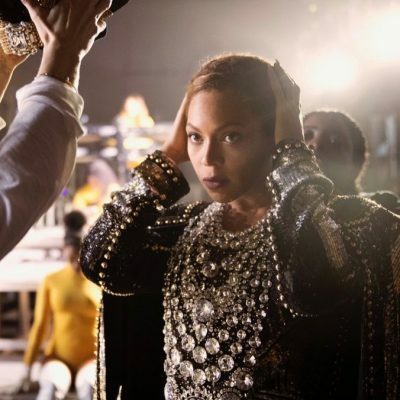 For starters, she is as much of a bombshell today as she was when she was nominated for an Academy Award for her role as the showgirl Olive Neal in Woody Allen’s Bullets Over Broadway (1994). As fast talking and quick witted as Rosalind Russell in His Girl Friday, she can mix it up with the boys when she plays poker at professional tournaments. 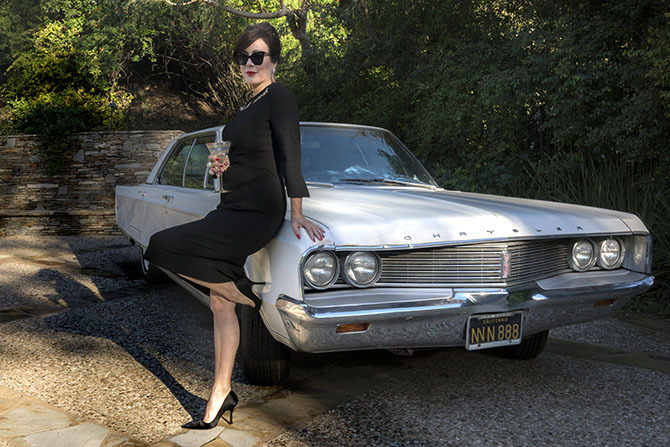 She’s also a girl’s girl who hopscotches the globe with her gal pals for her mid-century-style lady-like couture that’s very much in the mode of Rita Hayworth. 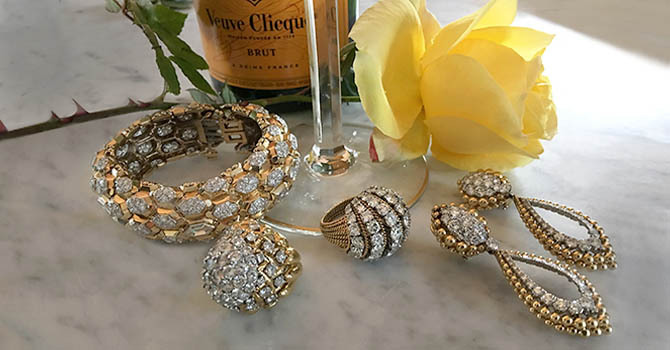 When it comes to jewelry, Jennifer’s passion is on a par with Elizabeth Taylor. Over the years, Jennifer has shopped for masterworks at the big auction houses. A few of the highlights in her world class collection include a bejeweled evening bag that once belonged to the Duchess of Windsor and a jaw-dropping pair of JAR shoulder dusters from Ellen Barkin’s 2006 auction at Christie’s. 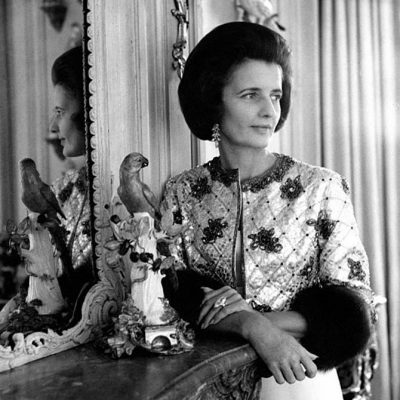 The most fabled item in her jewelry box is a Bulgari diamond and emerald floral spray she purchased in 2011 at Elizabeth Taylor’s estate auction at Christie’s in New York. While many of Jennifer’s jewels come with an impressive provenance, others she has infused with a new narrative that captures her singular wit and glamour like the time one of her favorite jewelry dealers showed her a large selection of David Webb in the late nineties. 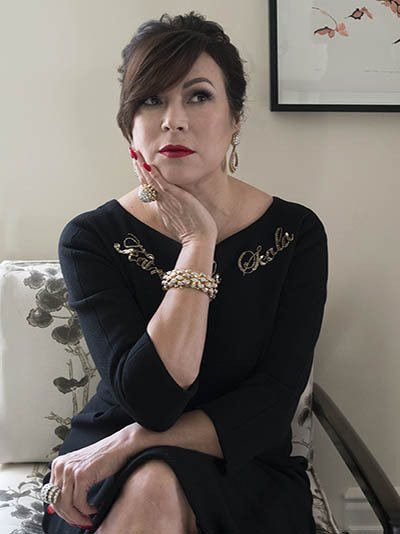 Jennifer recounted the story for me and posed for The Adventurine’s lenswoman Sally Davies, wearing some of her favorite David Webb jewels with one of her Alta Moda dresses by Dolce & Gabbana. Following is her delightful story. Well, I played a killer in high heels and there were definitely some shady things going on during the production. Anyway at the end of the week, I got paid in cash. They gave me a big paper bag of money which was a shock. This was before I was a poker player and used to dealing in cash. Anyway, I took the money off to my jewelry guy and gave it to him for the David Webb jewelry. I remember asking him, ‘Have you ever been paid in a bag of cash before?’ He laughed and said, ‘You’d be surprised.’ After he counted it, he gave me back three of the hundred dollar bills. He said, ‘These are counterfeit!’ But it was a happy ending, I got the jewelry.